Addressing a press briefing here at Airbus Safran Launchers’ production site, ASL Chief Executive Alain Charmeau said he expected the expected transfer of cash from Safran to Airbus to occur before the end of April. Airbus and Safran had agreed that Safran would pay Airbus 800 million euros ($874 million) in cash, in addition to its rocket-engine manufacturing capability, to become a 50-50 ASL shareholder with Airbus. Airbus officials since the beginning of the year have been negotiating with French tax authorities to determine how to minimize the tax bite of the cash transfer, which industry officials could be as high as 500 million euros, leaving Airbus with a net of just 300 million euros. Delays in the cash transfer have meant that ASL, which is expected to count 8,000 employees, has been operating with only around 400 employees. 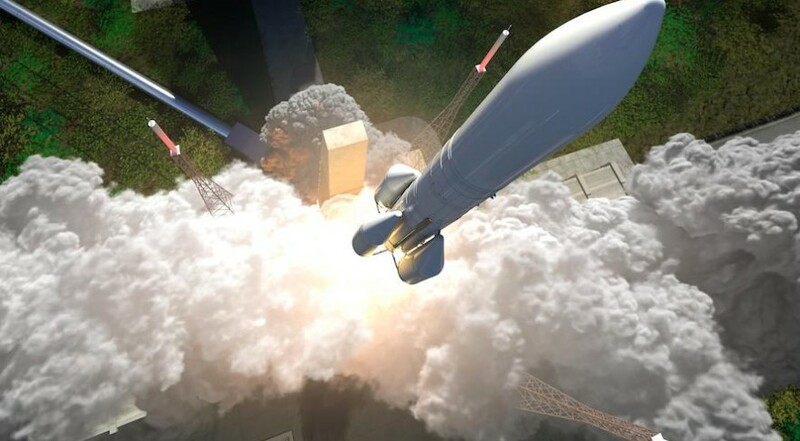 In addition, it has made it difficult for the initial ASL team to present a fixed-price Ariane 6 production proposal to the 22-nation European Space Agency, which is financing the majority of Ariane 6 development. Charmeau and other officials attending the briefing said there has been positive movement on the tax issue in recent days and that a late-April conclusion appeared possible. ASL then will provide its Ariane 6 cost proposal – Charmeau called it a “fixed price with variations” – by the end of April. Negotiations on the details will follow, after which ESA will conduct a scheduled Program Implementation Review. ESA will submit its conclusions of its review, which its governments had ordered as a condition of releasing the full complement of Ariane 6 funding — to the agency’s Ariane 6 participating nations in time for a decision by ESA’s ruling council on Sept. 13. The European Commission, which is the executive arm of the 28-nation European Union, has already approved ASL’s formation with several minor caveats. But ASL’s proposal to purchase the 35 percent stake in Arianespace now held by the French government faces a deeper review. The commission has said the review is likely to end, possibly with requirements that ASL must meet, by mid-July. Airbus officials in the past have referred to the creation of ASL, the signing of the ESA Ariane 6 contract and the de facto takeover of Arianespace as an indivisible package indispensable for the success of the Ariane 6 project. Charmeau repeated this assessment during the briefing, but said that the commission’s antitrust investigation “will have no effect” on the Ariane 6 design and contract schedule, assuming that the review is finished by September. The commission is looking at whether Arianespace’s minority shareholders, who are Ariane 6 contractors, will be protected once Airbus Safran Launchers raises its Arianespace shareholding to 74 percent from today’s 39 percent. The commission is also reviewing concerns expressed by satellite builders that Airbus, which is a major manufacturer of commercial satellites, might give its own satellites preferential treatment in setting the Ariane 6 manufest. Ariane 6 comes in two versions. The Ariane 62 has two solid-fueled strap-on boosters, which also serve as the first stage of Europe’s Vega small-satellite launcher, and is capable of placing a 5,000-kilogram satellite into geostationary transfer orbit. The Ariane 64 carries four strap-on boosters and can place satellites weighing a combined 10,500 kilograms into that orbit, which is where most commercial telecommunications satellites operate. Patrick Bonguet, Ariane 6 program head at ASL, said Ariane 6 is keeping to its promise of reducing per-kilogram launch prices by 40-50 percent compared to today’s Ariane 5. The goal, as it was in the beginning, is to complete with Hawthorne, California-based SpaceX’s Falcon 9 rocket. “Ariane 6 will have twice the mass and twice the volume of the Falcon 9, at less than twice the price,” Bonguet said. SpaceX’s Falcon 9 Upgrade recently demonstrated its ability to carry a 5,300-kilogram telecommunications satellite to geostationary transfer orbit by stretching its capacity to the limit. Bonguet was referring to a fully loaded Ariane 6, with 10,500 kilograms of satellite payload, and comparing that launch’s price to today’s Falcon 9, which typically carries just one geostationary-orbit satellite per launch. SpaceX prices are typically around $60 million per commercial launch. By the time the Ariane 6 enters service – the initial launch in mid-2020 is scheduled to lead to the full cadence of 11-12 missions per year by 2023 – SpaceX plans to be reusing its Falcon 9 first stage on a regular basis. SpaceX has said reusing the stage should allow them to reduce Falcon 9 prices by around 30 percent.